Welcome to the wedding of Kelsey & Daniel. 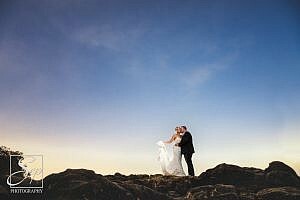 This was a very special wedding for us and one that has been in the planning for 2 years. Kelsey & Daniel are 2 of our very best friends and we were blessed to share in this special day with them. Kelsey is also a valuable part of our team as one of our second shooters. This wedding was captured by Stew & Brett as Emma was was a very proud Maid of honour for Kelsey. 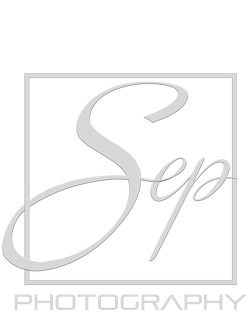 What also made this wedding prestigious was it was our 100th wedding captured as SEP Photography. 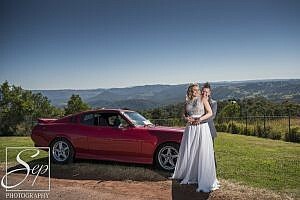 The wedding took place at Kilcoy farmstead which over looks somerset dam. Everything was styled to perfection and not a detail was missed, kelsey spent hours putting so much together by hand and also hand painting the signs. The morning of the wedding there was a layer of fog across the valley and we decided to capture a few quick images of the bride before she got hair and make up done. The whole day was relaxed and fun to be a part of, everything went so smooth and the weather could not have been better. 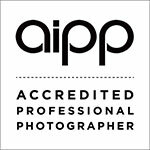 After the couple said their “I DO’S” it was time to head for portraits, we started at the farmstay and captured some beautiful images around the property with the huge 14 person bridal party before we made tracks to a private property on the edge of somerset dam. 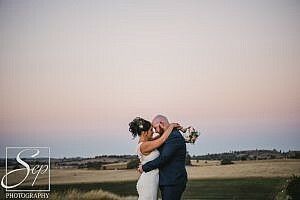 This was the perfect setting for sunset photos as the sun fell behind the hills and made a stunning afternoon glow. The reception took place under a fantastic marquee filled with hay bales and fairy lights, this was the most perfect styling for a farm wedding we have seen. This wedding had it all from Photo Booth and Great music all the way to an Ice Cream truck. After speeches were done and everyone was full from the fantastic food Kelsey and Daniel started off the dancing, their beautiful first dance was magical with a layer of fog across the dance floor it looked they they were dancing on clouds. We loved every minute of this wedding and wish Kelsey and Daniel all the best in the future and thank you for choosing SEP Photography to capture your special day.